These are the Common Core Weekend Reads for December 14, 2014. 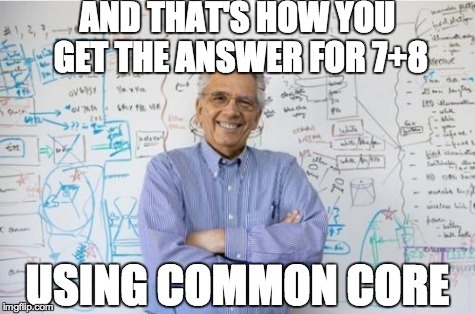 This is a review of the past week of news on Common Core nationwide and in North Carolina. Articles are organized by category. Weekend Reads archive at StopCommonCoreNC HERE. The next ASRC meeting is this coming Monday, December 15th. “Career Education” Is The New “Career and College Ready”? Why is NC still a member of SBAC? He was a “very, very conservative governor in Florida; he cut taxes like Ronald Reagan did,” said Dan Henninger. So if conservatives generally are going to say that if – because – he said something about, or supported Common Core, or they don’t like something he said about immigration, therefore, he can’t even consider being a nominee, then the Republican Party is going to have a big problem. Many teachers remain bitter over what they perceive as King’s mismanagement. “He screwed up New York, and now he can go to Washington and screw up the whole country,” said Tony Felicio Jr., a teacher-union president in the Connetquot district. If teachers are judged by student test scores, how about state education leaders? Shimer College Doesn’t Give a S**t About what David Coleman Thinks? Tracking Your Child’s Data: Who Has it, Why is it Being Gathered, Where is it Going? Mom to Common Core task force: Take the 4th-grade PARCC practice test. I dare you to tell me it makes sense. This entry was posted in Academic Standards Review Commission, Common Core. Bookmark the permalink.